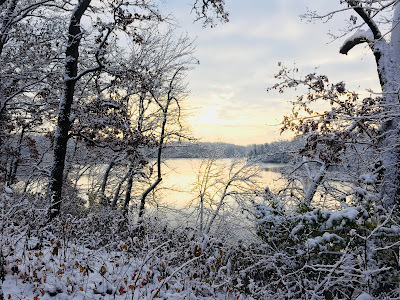 On November 3, I was at Bentonsport, November 7 at Indian Lake. In between, I came home to caulk a leak in the trailer and to take my wife to the airport for a trip to the West Coast. 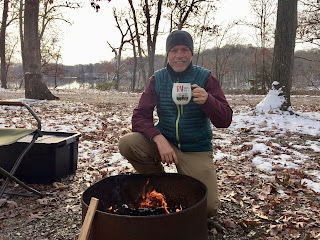 By 3:30 in the afternoon, I was sitting by the campfire, dodging smoke blown by a west wind and enjoying the warmth of the fire as the day slowly slipped to dusk. 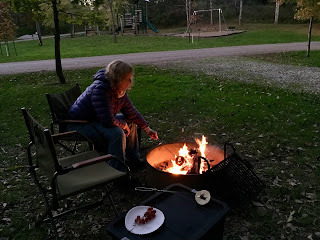 Sitting by the campfire and enjoying the warmth was a regular activity during my stay that extended to four nights. The high for the day had been 46 degrees, and the low for the next morning was forecast to be 26. The Indian Lake campground was winter ready, with the showers and flush toilets closed and chemical toilets made available. Water and electricity still flowed, and I was parked at the far end of the campground, where I'd never camped before when tent camping. Leaves covered the gravel, and the leaf fall opened up the view to the lake. The spot was really quite nice--privacy because of the time of year, leaves beautifying the gravel-beneath-the-trees sites, and the chemical toilet very clean and odorless (thanks to the cold weather). The only inconvenience was that I had to walk about two hundred yards to fill the water bucket. Paper plates lessened this inconvenience, though, since I had brought my drinking and cooking water. I dumped whatever water was left in the wash bucket at the end of the day so that it wouldn't freeze. Drinking water and dry food were stored in the trailer, along with yams and potatoes so that they wouldn't freeze. Two coolers were kept in the car, one for items such as milk and cheese, and the other smaller (and cheaper) icebox holding vegetables: asparagus, zucchini, broccoli, Brussels sprouts, and kale. This arrangement was fine at twenty-six degrees, but when the temperature dropped to fourteen degrees, the asparagus and zucchini had to be thrown out because it had frozen. All the brassicas were okay, though. After the fifteen-degree night, though, I kept the remaining fresh vegetables in the cooler and inside the trailer during the nights, stashed in the space below the bed. Or, to use alliteration, I did this to keep fresh food from freezing. On the coldest night I was a little nervous since I was still exploring and testing the capabilities of the trailer. That night I spread an opened a Coleman cotton sleeping bag over my down bag, and this really added to the warmth. I also had researched the Pelonis oil space heater that was the trailer's heat source. It has three Watt settings: 600, 900, and 1,500. For most of the night I used the 900 setting, which provided enough heat radiance to keep up with the cold; at one point I lowered the setting to 600 Watts. The roof vent was cracked open a bit, and one window. I wondered what I'd do if the electricity went off, then realized that I could always get in the car, start the engine, and enjoy the heater. 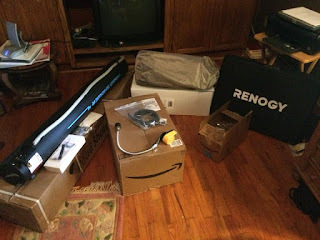 I'm also going to research a small propane heater for emergencies. Although I'm not crazy about the quality of the air that would probably produce, for getting through a night without freezing, it seems like a good fallback possibility. 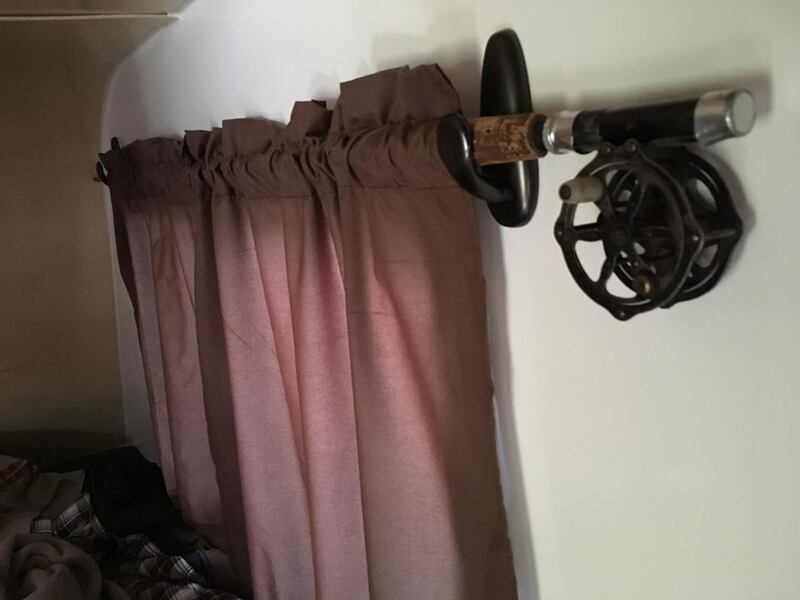 Let me explain my reluctance to use a propane heater in my tiny trailer. Although there are standards for air quality and also units have an automatic shutoff to stop asphyxiation, I still question such units as being the healthiest option. Writing in my daybook was a pleasant task each day, although writing in gloves was somewhat challenging. The cold wind, though, was sufficient motivation for me to adapt. I was able to write, enjoy the fire, and look beyond the fire to the muted panorama of the leafless trees and the gray, wind-rippled waters of the lake. 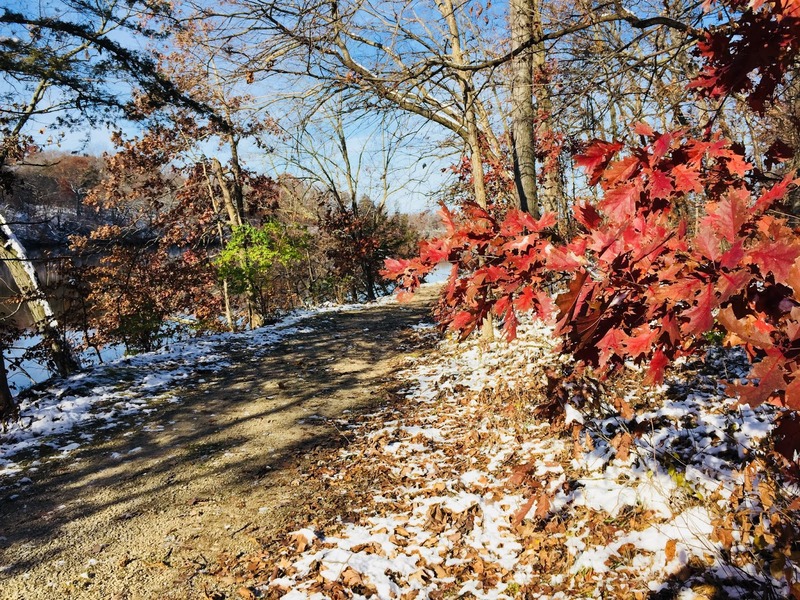 The pale blue sky and the steel gray water, the dark silhouettes of the trees still holding a few rust-red leaves were contrasted by bright green grass that fringed the south cove of the lake that was fronted by a wide meadow. Many of the ideas for this blog post were first written into my daybook, sitting by the fire, a cup of tea nearby. I arrived on Wednesday afternoon and stayed until Sunday afternoon. Originally, I had planned to return home on Monday but family plans shortened my stay by one night. 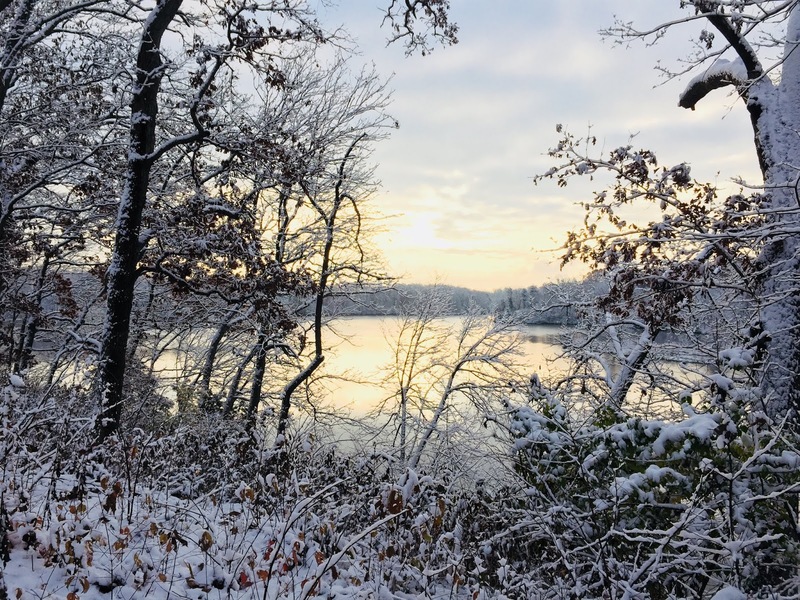 Two inches of snow arrived on Friday, flurries with winds. 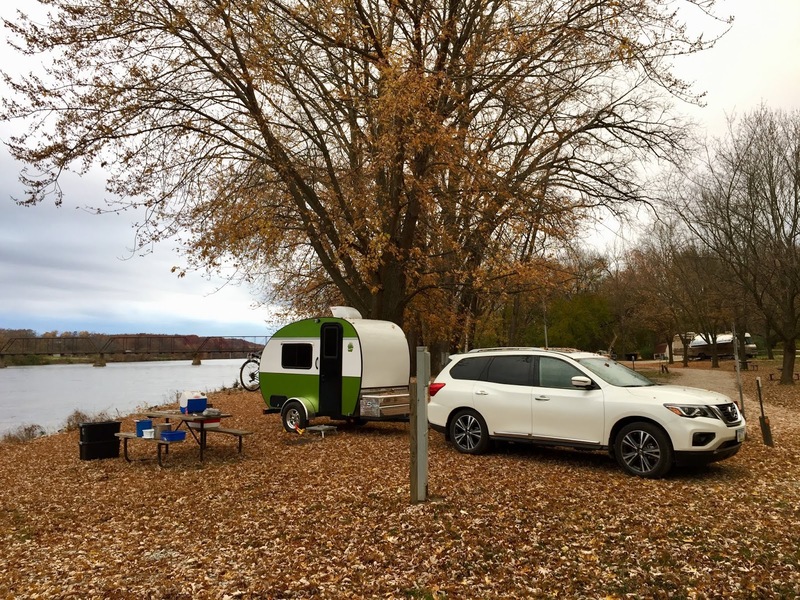 Yes, fall camping all right, and many new experiences! I enjoyed experimenting more with cooking inside the Green Goddess, or cooking outside with the induction burner, which is not bothered by a wind. My favorite dish this trip was baked vegetables and feta cheese, cooked with olive oil and a Herbs de Provence seasoning mixture. I cooked this three out of the four days (and one of those three days inside the trailer). 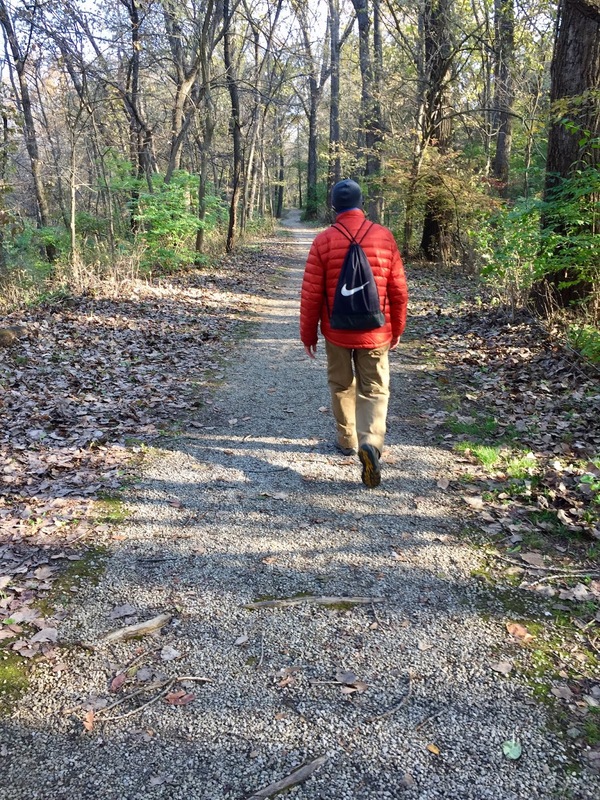 My favorite activity on this trip was the lake trail that goes around the lake. 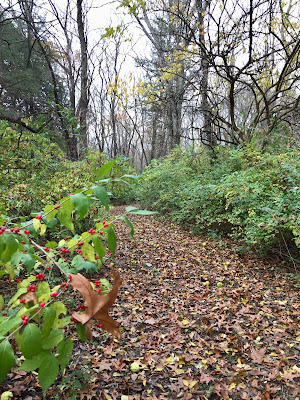 On Thursday, I rode the trail on my bike, walking those portions where trail steepness and slick leaves prompted caution. The next three days I walked the trail, taking photos and just enjoying the quiet of the lake and the trees. One interesting insight from this trip was how I became more used to the colder temperatures. Of course I dressed warmly, but I found myself outside in temperatures in the 20's and perfectly comfortable, just enjoying the wind in the trees and the falling snow, just enjoying how the morning after the snow the blue sky and was such a wonderful contrast to the snow quilting the land. Usually I enjoy riding my bicycle, but this trip I especially enjoyed walking. The movement felt good, and although it's hard to imagine, walking was even more in-the-moment in terms of interacting with the environment. It's easy with biking to become absorbed with the physical act of riding the bike--spinning, pumping up a hill, shifting the gears. 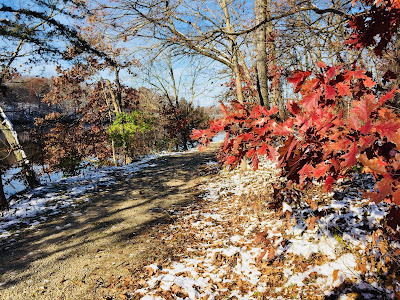 Walking requires much less attention--I just had to make sure I didn't slip on the snow-covered leaves on the steep portions of the trail! 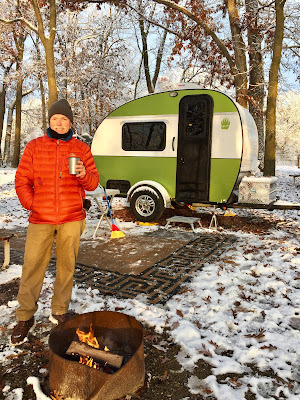 I think the last few camping experiences I've had validate my opinion that weekday and off-season camping allow for more interaction with nature because there are fewer campers sharing the campground with you. The other side of that coin is that if you enjoy social interaction and meeting other campers, then camp on the weekends and during the summer vacation season! Neither quiet nor community is more right than the other; they just fulfill different needs and expectations. For me, right now, I enjoy finding a way to let nature be more to the forefront. I am home now from my trip, enjoying some time with my wife. We'll see if schedule and weather allow us to get out any more this season. I have a couple of other leaks to fix in the trailer, which my carpenter son-in-law will help with. I will also buy a tarp for covering the trailer. Whether it remains covered for days, weeks, or a few months is a wonderful source of speculation for my wife and me. 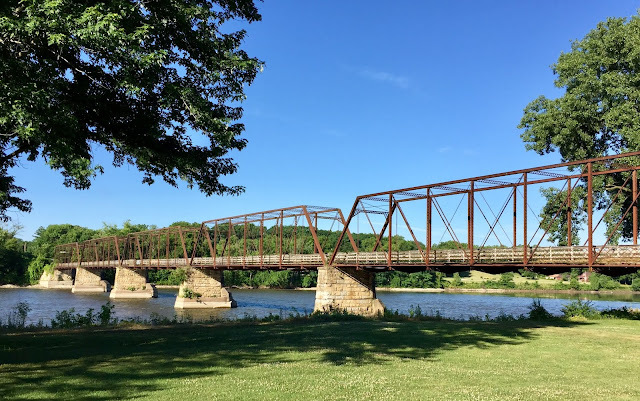 Bentonsport is an old town in southeast Iowa, an old river town that was once a hub of river commerce and that is now a hamlet where folks live quietly and tourists--and campers--visit. 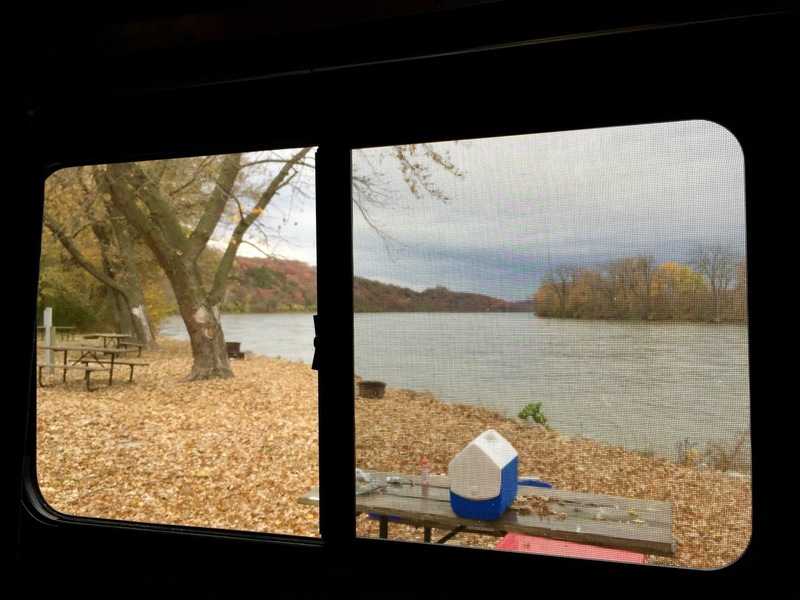 Bentonsport Campground is right on the river, flowing water on one side and now, in early November, the campground is a yellow, umber, and scarlet carpet of fall leaves. The rich smell of leaf mulch is a fragrance that permeates the environment, just wonderful, the lush river and forest smells. When I arrived, the water rippled with shades of grey, reflecting the colors of the sky, for it rained off and on during my stay in my tiny trailer. 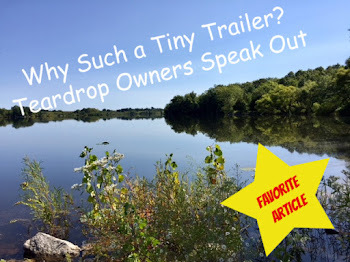 I didn't even unhitch because the trailer was perfectly level on the gravel pad next to the water, the head of the bed just a touch raised. I was planning on continuing my way in three days, anyway, to Indian Lake at Farmington, eleven miles away. The county planned to shut off the water in three days, along with the flush toilets at a shelter in the park about a tenth of a mile away. The Indian Lake campground was booked pretty full anyway for the weekend. At Bentonsport, the only campers were the hosts and one cold, wet, and miserable guy in a tent who was an instructor for a weekend chainsaw class for beginners--and the class was not in the campground! Yay, although I did have earplugs. I arrived on Friday at about noon, set-up camp, and then took a walk. Set-up was minimal because rain was forecast, therefore, no awning or table set-up. I just got the trailer ready and set out materials on the campground picnic table that wouldn't blow away with the wind. Then I took a walk, exploring the area outside the campground. I've camped here before, twice, both times while bicycle touring. 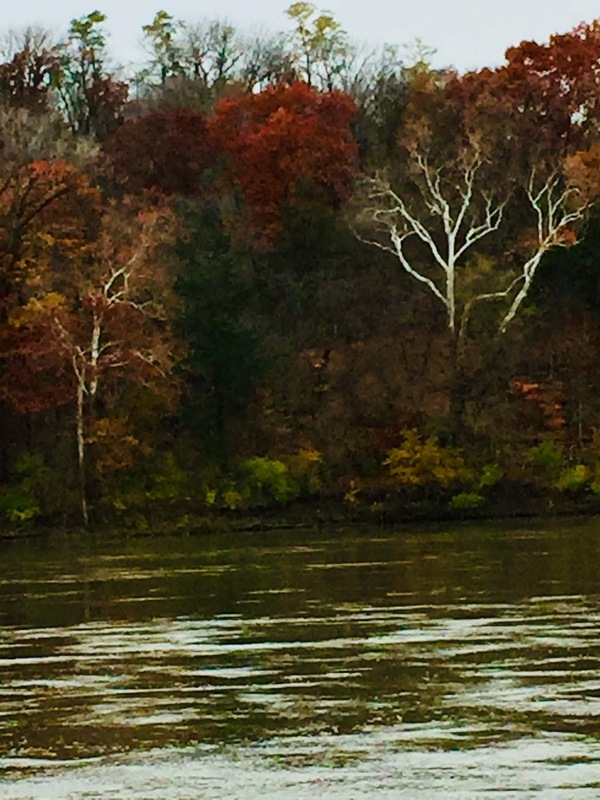 I walked a mile down Hawk Drive along the Des Moines River, beautiful riverfront with trees with brilliant foliage and stark white trunks mixed with evergreens, framed top and bottom by the cloudy sky and flowing river. Returning to camp, I also explored the city park and the old Bentonsport bridge, which is now closed to all traffic except bicyclists and pedestrians. An amusing anecdote to share (detailed on my bicycle blog) is that the first time I camped here, I headed out the next morning to follow Hawk Drive to a couple of other gravel roads that would lead me to Highway 1 and then home. 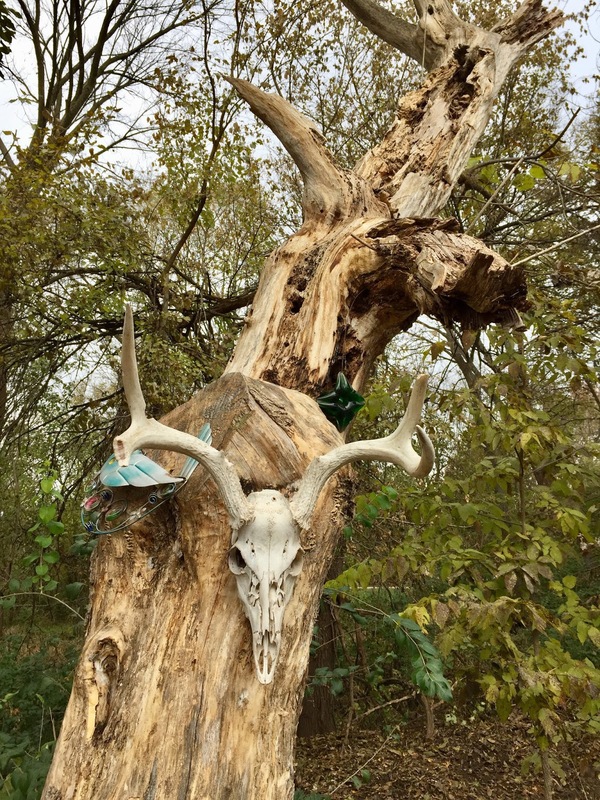 Hawk Drive followed the river and narrowed until finally ending in overgrowth. Obviously the road was not continuously maintained. I checked Google Maps (that had suggested this route) using the satellite mode, and saw that the road was not maintained for about two miles. So I had a choice--add about twelve miles to my trip home or beat my way through the two miles of neglected gravel road. I could see where the road continued; it had been explored by 4WD vehicles that season. I decided to go for it, pushing the bike for most of the way, forging my way through tall weeds, sometimes the trees and brush curving over me to form a canopy, scaring up a few deer, and miraculously coming out to a small abandoned bridge over a stream (probably the reason why the road wasn't maintained--not enough traffic to justify a new bridge), and onto maintained gravel where a man was tending grape vines in his backyard. He looked at me, startled. "Google said this road goes through!" I exclaimed. "Took ya out into the wilderness, hey?" he said. 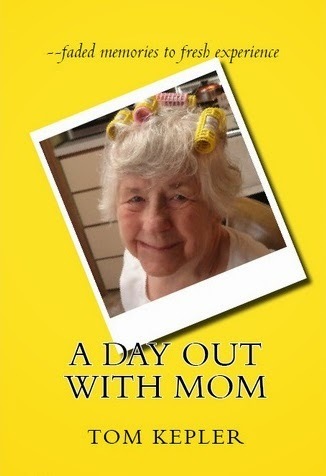 I agreed, and now have a fun experience to relate, although the ramble had me wondering a time or two. 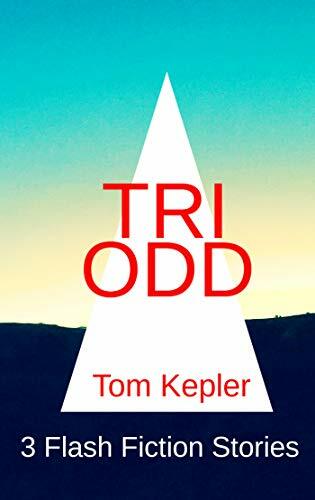 Coming back to camp, I followed what appeared to be a river trail until I came to a secluded river cabin and a big red stop sign, beneath it another sign that said "Beware of Dog." I decided discretion is the better part of valor and returned to camp to bake veggies and feta for dinner. The next morning, I mixed in the leftover veggies and feta with scrambled eggs for a big breakfast, so I decided to take another walk. Up away from the campground and across Highway J40 was a sign for the Bentonsport Nature Trail, up the hill steeply, climbing out of the river basin. I followed it, a nice walk through forest up the hill and then onto a trail of mixed prairie and forest for about a mile. Taking a fork that would return to camp, I met up with the chainsaw class. 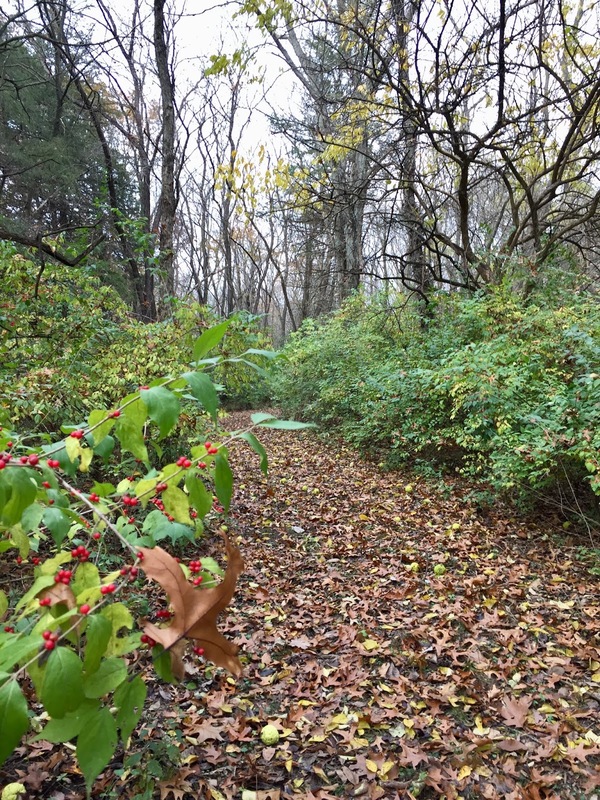 For their practice, they were clearing invasive species of trees from the county land so that native species could re-establish themselves. They all stopped their buzzing when I met them on the trail, everyone wearing their heavy bright yellow and orange safety gear and hardhats, saws in hand. 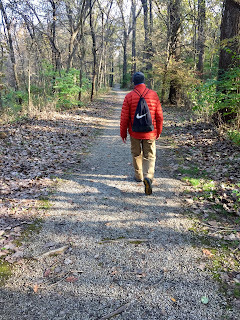 "Some guy walkin' the trail," one of the anonymous, colorful figures said, and I was led through the cut zone and continued on my way. There was some point in this interchange when I joked (to myself) that I was glad I'd never watched any of those chainsaw massacre movies! The fall forest smells were especially inviting, what with the falling leaves, the rain showers, and the fresh smell of sawdust. The poison ivy was also a beautiful, luminous red--and fairly abundant; however, I was able to contain my enthusiasm and stay out of it. The total trail walk was about two and a half miles, estimating from the signage along the way. When I had passed through Bentonsport on bicycle, I had completely missed the trail and some of the beauty of the Bentonsport area. I'm glad I've stayed there longer and am now more familiar with the area. It started to rain, so I was inside more, learning how to cook in my tiny trailer. This time for lunch I had steamed vegetables and potato salad, for dinner a toasted bagel with cream cheese and homemade black raspberry jam. I read, wrote, watched the Matt Damon movie The Martian on my cellphone, and then went to bed. It rained hard, and I realized about midnight, waking up, that this would be a good time to see if I had successfully caulked that leak in my cargo hatch. I was able to pull a few stored items out from beneath the bed, wiggled under with a flashlight, and checked. The hatch wasn't leaking, but there was still a small seep in the lower right hand corner of the trailer. It was at this point that I decided that, come the next morning (and the shift to standard time), I would head home to do some more caulking before heading out again. The next morning camp breakdown was swift, since I was already hooked up and had stored items out of the rain. I loaded just three boxes and my dishwashing buckets and headed out, listening to the Chieftains' Nashville Sessions CD. 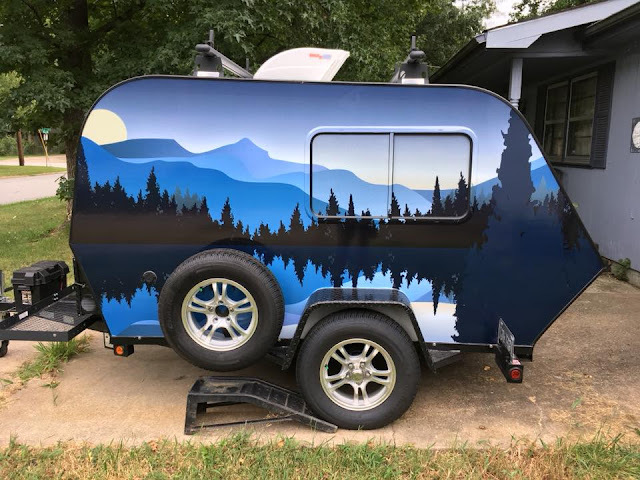 It was an easy drive home, and after talking to my son-in-law, who is a builder, I have a clear idea of how to caulk my trailer. Tomorrow has promised to be windy and dry. Then the day after I can head out to camp at Indian Lake, challenging myself to my first camping when the weather drops to a range of highs in the 30's to lows in the teens. The trailer so far has done well in the twenties as far as temperatures go; in fact, my biggest sleep issue has been getting too warm, not too cold! 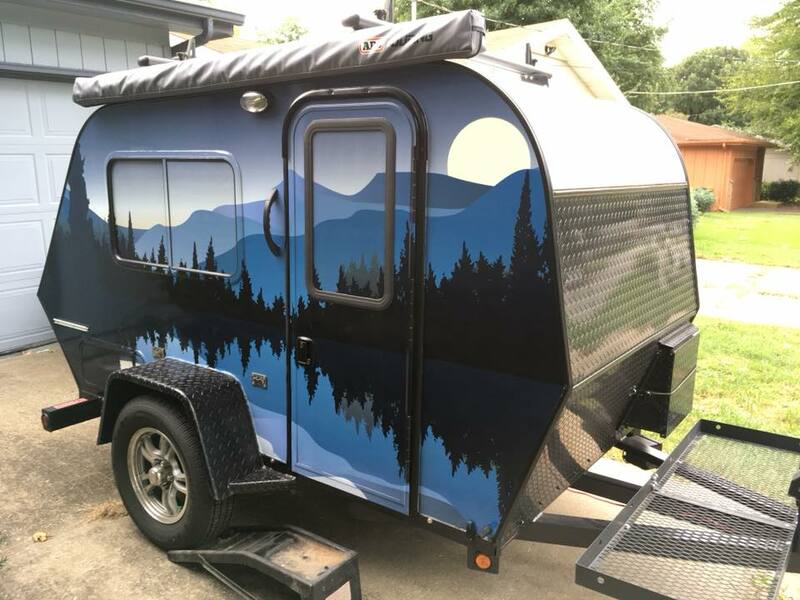 It sounds like I might have another adventure to relate, as soon as I finish my trailer touch-up, wash and pack all my thermal underwear, and head on down the road. It's late October, just past the harvest moon, fifty-five degrees, and the trees are in full reds and yellows, the sky blues and grays, and the fire is a quiet companion as I sit and write at my camp at Jefferson County Park, a campground just four miles from my house. 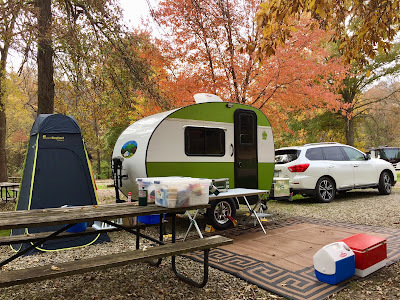 In the first half of the month, my wife and I spent five nights at this park; now we are spending four nights, enjoying the mild fall weather with our new tiny trailer. 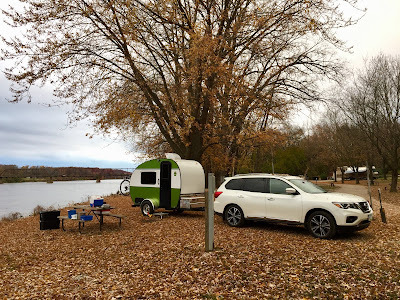 It seems to be hard to beat fall camping, the smells of the season a richness of completion and satiation, the summer ended, the seed sown, and the squirrels busy stuffing themselves prior to the first snowfall. No bugs! Mind if I repeat myself? No bugs, no bugs! No flies and mosquitoes or ticks. This fact alone is worth wearing thermal underwear. I stop writing and gather sticks from the surrounding campsites to feed the fire and conserve my firewood. 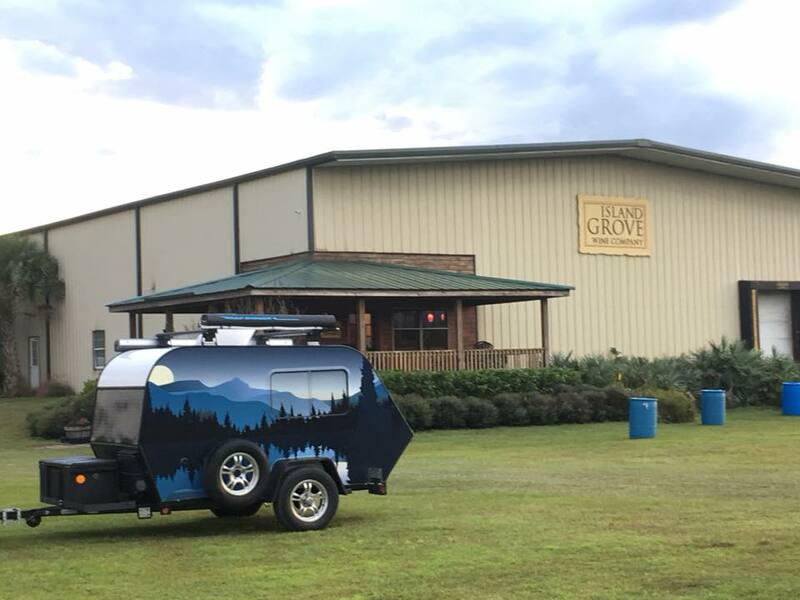 Of the twenty-five campsites in this small campground, we are the only campers resident, although an RV down the way and a 5th-wheeler around the corner are parked here, the owners probably waiting for the weekend. The campground closes at the end of October, so we'll see if there is a last-minute scramble this weekend prior to its closing. I doubt it, and it's unfortunate that so many are missing this mild weather and this easy sliding of fall into winter. 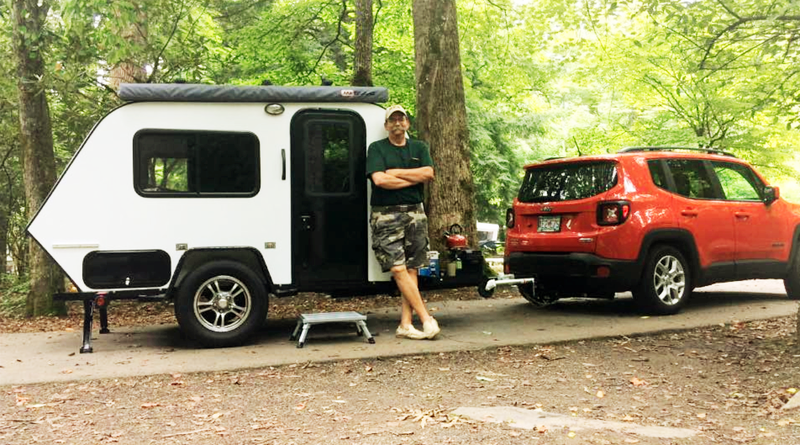 Owning a tiny trailer really extends the camping season. Wet weather or cold weather are much less of a challenge--or should I say that such weather becomes an enjoyable challenge rather than a survival experience? If I had to characterize camping in our tiny trailer, I would describe the experience as having a home away from home, a familiar living environment out in nature. Relaxing in nature in our second home, the Green Goddess. This is different than my bicycle camping trips, where the focus is more on the day's journey, the sights and sounds of the road, the experience of the body working well as I travel up and down the rolling hills of Iowa. Camping on a bicycle is reaching the campground, setting up camp, eating, showering, and joyfully climbing into my one-person tent and resting. Usually, also, this experience includes some pretty hot weather during the day. 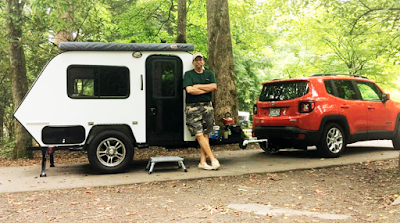 Here at Jefferson County Park with our tiny trailer, my wife and I hike and enjoy the campfire, I enjoy cooking more complex meals with toaster oven or Instapot pressure cooker, or on our induction burner or Coleman propane stove while she works. She enjoys getting away from the office, and I enjoy familiar routines engaged in outside. Soon it won't just be cold; it will be damn cold, so we're enjoying our time outside and together. Bicycle touring is epic; tiny trailer camping is bucolic, or if not that, then rustic. And autumn is a quiet time, past the summer busyness of the family vacation season, past the time of two nights out and go home. My wife and I are fortunate that if the phone signal is strong, she can work at camp, so we can camp during the week. 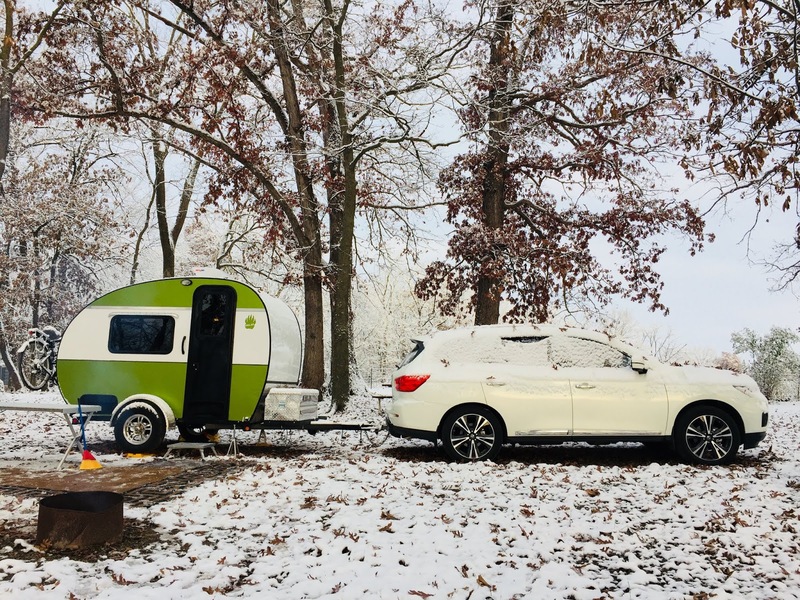 Combine weekday camping and off-season camping, and the experience is idyllic--not too cold or hot, not too crowded, everything in moderation except the beauty of the season. 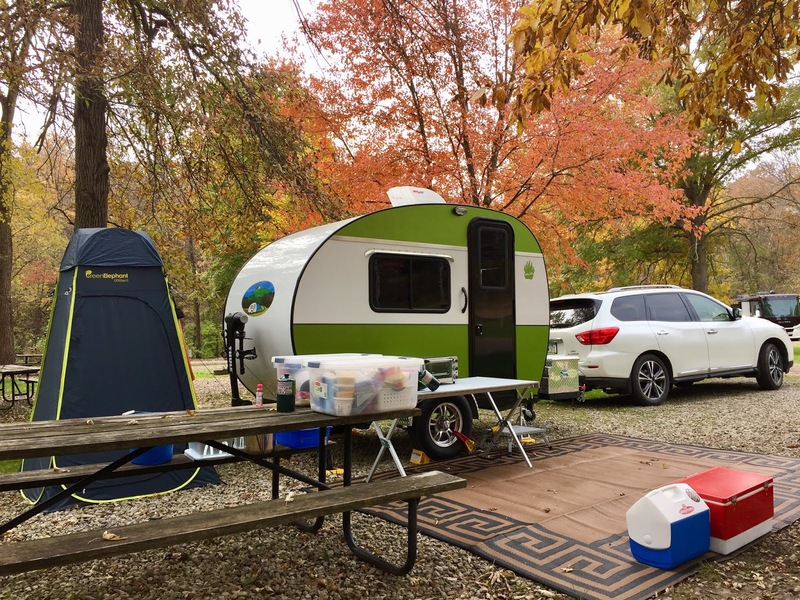 Yes, fall leaves and camping, please.